Scoring my first goal for Preston in the win at QPR last week was a big moment for myself and even more welcome was the three points. I was brought here to score as many goals as I could from midfield, so to be off the mark in only my second game was satisfying. When the ball came my way for the goal, I didn’t have much time to think about it. The goalkeeper parried Lukas Nmecha’s shot and it came into my path. With the way the ball was bouncing I needed to hit it into the ground and to see it go into the far corner was brilliant. The goal rounded off a great win for us and one which was much needed. We’d spoken before the game about how important three points were and to do that by scoring four goals away from home made for a very good day. In the first 20 to 25 minutes, we were relentless and there was only one side in it. We got the first goal through Jayden Stockley and built from there. Jayden and Jordan Storey, like myself, both got their first goals for Preston. It is probably not often that you get three players on the scoresheet for the first time in the same game. The win at QPR will have given us a lot of confidence to take into the Stoke game on Saturday. We had drawn the week before against Swansea so four points in two games isn’t so bad. I have been at the club three weeks now and it’s been easy to settle in. The other lads have been very welcoming and the fact I’m not the only new signing has helped. I’m staying in a hotel at the moment, as are Jayden Stockley and Josh Ginnelly. The hotel is nice but there is nothing better than having your own space, so I’ll look for a house locally over the next few weeks. Moving in January means everything happens pretty quickly. Summer transfers tend to be more drawn out because people are on holiday and you have a few weeks to get things done. It is a bit strange when one day you are in a dressing room where you have been for 18 months, then the next day you are somewhere else with a different set of lads. That is the nature of the game I suppose, players move clubs and you have to adapt quickly. The move to Preston was one I had heard about for a couple of weeks before it happened. Then it was all go, with my agent ringing me to say that Preston wanted to meet me and it was all going through. 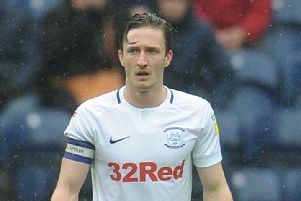 If the transfer was going to go through, both Preston and Barnsley wanted it done early in the window. That way, Preston had me in the squad and Barnsley had time to look at players they wanted to bring in. I’m looking forward to the Stoke game this weekend. They are a club who were in the Premier League for a number of years and only got relegated last season. Recently they have had a change of manager so their players will be looking to catch his eye. Stoke beat Leeds 2-1 last week and with us winning at QPR, you’ve got two teams meeting on the back of really good results. If we do the things we did last week, there is no reason why we can’t come back with something. We want to put together a good run of results and get climbing up the division. My football roots go back to being a young lad growing up in Hexham. Newcastle United spotted me playing locally and I was in their academy from the age of eight through to 16. I’d always supported them as a youngster so being at Newcastle was a big thing. There were a few lads there with me who have gone on to make a career. There’s Marcus Maddison at Peterborough, while in the age group a couple of years above me was goalkeeper Jak Alnwick. Sammy Ameobi was an age group above me too. Newcastle released me when I was 16 and while that was disappointing, I knew I had plenty of time to make a go of it. I went to Carlisle United and had two years in the youth system there and three as a professional. That time at Carlisle really got my career going. From there I went to play for Blackpool for two years and then I had 18 months at Barnsley. You learn something from every club you play for and my aim is to develop here at Preston and take some big strides forward. We have got a squad here with a lot of younger players, balanced out with some more experienced lads like Paul Gallagher and Tom Clarke.